Story, as it turns out, was crucial to our evolution—more so than opposable thumbs. Opposable thumbs let us hang on; story told us what to hang on to. Story is what enabled us to imagine what might happen in the future, and so prepare for it—a feat no other species can lay claim to, opposable thumbs or not. Story is what makes us human, not just metaphorically but literally. Recent breakthroughs in neuroscience reveal that our brain is hardwired to respond to story; the pleasure we derive from a tale well told is nature’s way of seducing us into paying attention to it. In other words, we’re wired to turn to story to teach us the way of the world. What’s the role the writer can play? Writers can change the way people think simply by giving them a glimpse of life through their characters’ eyes. They can transport readers to places they’ve never been, catapult them into situations they’ve only dreamed of, and reveal subtle universal truths that just might alter their entire perception of reality. In ways large and small, writers help people make it through the night. And that’s not too shabby. But there’s a catch. For a story to captivate a reader, it must continually meet his or her hardwired expectations. This is no doubt what prompted Jorge Luis Borges to note, “Art is fire plus algebra.” Let me explain. Fire is absolutely crucial to writing; it’s the very first ingredient of every story. Passion is what drives us to write, filling us with the exhilarating sense that we have something to say, something that will make a difference. What’s the “algebra” part then? But to write a story capable of instantly engaging readers, passion alone isn’t enough. Writers often mistakenly believe that all they need to craft a successful story is the fire—the burning desire, the creative spark, the killer idea that startles you awake in the middle of the night. They dive into their story with gusto, not realizing that every word they write is most likely doomed to failure because they forgot to factor in the second half of the equation: the algebra…It’s only by stopping to analyze what we’re unconsciously responding to when we read a story—what has actually snagged our brain’s mention—that we can then write a story that will grab the reader’s brain. This is true whether you’re writing a literary novel, hard-boiled mystery, or supernatural teen romance. Although readers have their own personal taste when it comes to the type of novel they’re drawn to, unless that story meets their hardwired expectations, it stays on the shelf. To make sure that doesn’t happen to your story, this book is organized into twelve chapters, each zeroing in on an aspect of how the brain works, its corresponding revelation about story, and the nuts and bolts of how to actualize it in your work. Each chapter ends with a checklist you can apply to your work at any stage: before you begin writing, at the end of every writing day, at the end of a scene or a chapter, or at 2:00 a.m. when you wake up in a cold sweat, convinced that your story may be the worst thing anyone has written, ever. (It’s not; trust me.) Do this, and I guarantee your work will stay on track and have an excellent chance of making people who aren’t even related to you want to read it. The only caveat is that you have to be as honest about your story as you would be about a novel you pick up in a bookstore, or a movie you begin watching with one finger still poised on the remote. The idea is to pinpoint where each trouble spot lies and then remedy it before it spreads like a weed, undermining your entire narrative. It’s a lot more fun than it sounds, because there’s nothing more exhilarating than watching your work improve until your readers are so engrossed in it that they forget that it’s a story at all. So What are the secrets? #2: How to Zero in on Your Point…To hold the brain’s attention, everything in a story must he there on a need-to-know basis. Secret #3: I’ll Feel What He’s Feeling…All story is emotion based – if we’re not feeling, we’re not reading. Secret #4: What does your Protagonist Really Want?…A protagonist without a clear goal has nothing to figure out and nowhere to go. Secret #5: Digging Up Your Protagonist’s Inner Issue…You must know precisely when, and why, your protagonist’s worldview was knocked out of alignment. Secret #6: The story is in the specifics…Anything conceptual, abstract, or general must be made tangible in the protagonist’s specific struggle. Secret #7: Courting Conflict. The Agent Of Change…Story is about change, which results only from unavoidable conflict. Secret #8: Cause of Effect…A story follows a cause-and-effect trajectory from start to finish. Secret #9: What Can Go Wrong And Then Some…A story’s job is to put the protagonist through tests that, even in her wildest dreams, she doesn’t think she can pass. Secret #10: The Road from Setup to Payoff…Readers are always on the lookout for patterns; to your reader, everything is either a setup, a payoff. or the road in between. Secret #11: Meanwhile Back at the Ranch…Foreshadowing, flashbacks, and subplots must instantly give readers insight into what’s happening in the main storyline, even if the meaning shifts as the story unfolds. Secret #12: The Writer’s Brain On Story…There’s no writing; there’s only rewriting. So, What Is a Story? “What happens” is the plot. “Someone” is the protagonist. The “goal” is what’s known as the story question. And “how he or she changes” is what the story itself is actually about. What Is This Story About? 1. Whose story is it? 2. What’s happening here? 3. What’s at stake? Knowing what the focus of your story is allows you to do for your story what your cognitive unconscious does for you: filter out everything extraneous, everything that doesn’t matter. You can use it to test each proposed twist, turn, and character reaction for story relevance. That’s what readers come for. Their unspoken hardwired question is. If something like this happens to me, what would it feel like? How should I best react? Your protagonist might even be showing them how not to react, which is a pretty handy answer as well. Adding External Problems Adds Drama Only If They’re Something the Protagonist Must Confront to Overcome Her Issue That’s why, when writing your protagonist’s bio, the goal is to pinpoint two things: the event in his past that knocked his worldview out of alignment, triggering the internal issue that keeps him from achieving his goal; and the inception of his desire for the goal itself. Sometimes they’re one and the same. Six Places Where the “Specific” Often Goes Missing: 1. The specific reason a character does something…2. The specific thing a metaphor is meant to illuminate…3. The specific memory that a situation invokes in the protagonist…4. The specific reaction a character has to a significant event…5. The specific possibilities that run through the protagonist’s mind as she struggles to make sense of what’s happening…6. The specific rationale behind a character’s change of heart. Unless They Convey Necessary Information, Sensory Details Clog a Story’s Arteries. There are three main reasons for any sensory detail to be in a story: 1. It’s part of a cause-and-effect trajectory that relates to the plot—Lucy drinks the shake, she passes out. 2. It gives us insight into the character—Lucy’s an unapologetic hedonist headed for trouble. 3. It’s a metaphor—Lucy’s flavor choice represents how she sees the world. And that, my friends, is what makes stories so deeply satisfying. We get to try on trouble, pretty much risk-free. The Importance of the Highway between Setup and Payoff: Three Rules of the Road…Rule One: There must actually be a road…Rule Two: The reader must be able to see the road unfold…Rule Three: The intended payoff must not be patently impossible. Here’s a secret: when you’ve tapped into what it is we’re wired to respond to in a story, what we’re hungry for from the very first sentence, it is your truth we hear. As neuroscientist David Eagleman says, “When you put together large numbers of pieces and parts, the whole can become something larger than the sum…The concept of emergent properties means that something new can be introduced that is not inherent in any of the parts.” What emerges is your vision, seen through the eyes of your readers, experienced by your readers. So what are you waiting for? Write! Although they may not know it yet, your public is eager to find out what happens next. A must read book on story-telling and writing. For another recommendation within this subject area, I suggest Storycatcher, and The Story Factor. 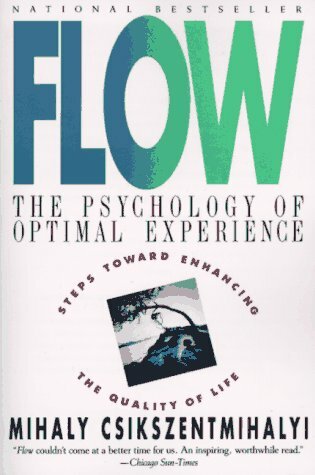 I just finished reading Flow – The Psychology Of Optimal Experience – Steps Toward Enhancing The Quality Of Life by Mihaly Csikszentmihalyi. I recently finished reading Liberating The Corporate Soul – Building a Visionary Organization – by Richard Barrett. I recently finished reading the Mojo: how to get it, how to keep it, how to get it back if you loose it, by Marshall Goldsmith. The book then expands on what are the foundational elements of Mojo: “Four vital ingredients need to be combined in order for you to have great Mojo. The first is your identity…The second element is achievement…The third element is reputation…The fourth element to building Mojo is acceptance…By understanding the impact and interaction of identity, achievement, reputation, and acceptance, we can begin alter our own Mojo – both at work and home.” After spending time explaining and illustrating each of these areas, Marshall then presents a complete toolkit of actions one can take to build/improve one’s Mojo. I have included below excerpts that further summarize these concepts. What I particularly enjoyed about this book is the thoroughness in which the topic is covered: from summarizing the concepts, to explaining them and giving practical examples illustrating them, to finally presenting a toolkit on how to apply them. A recommended read that complements well Marshall’s other work: What Got You Here, Won’t Get You There.